Today is my husband’s birthday. And it’s not just any birthday, it’s his 30th birthday. And just like any milestone birthday, this one is complete with pomp and circumstance, as well as a dose of anxiety, deep contemplation, and a little bit of sadness. Eric’s new goal, now that he’s in his 30s, is to run a 100-mile race. You know, ’cause that’s something not every person can do. Apparently that isn’t hard enough though, so to make it more challenging, it has to be run in 24 hours. (He’s been researching this for hours, and I cannot tell you how excited he was to find a race like this in our area.) I told him that it’s a great goal and all, but maybe he should just run the marathon again and beat his last year’s time. 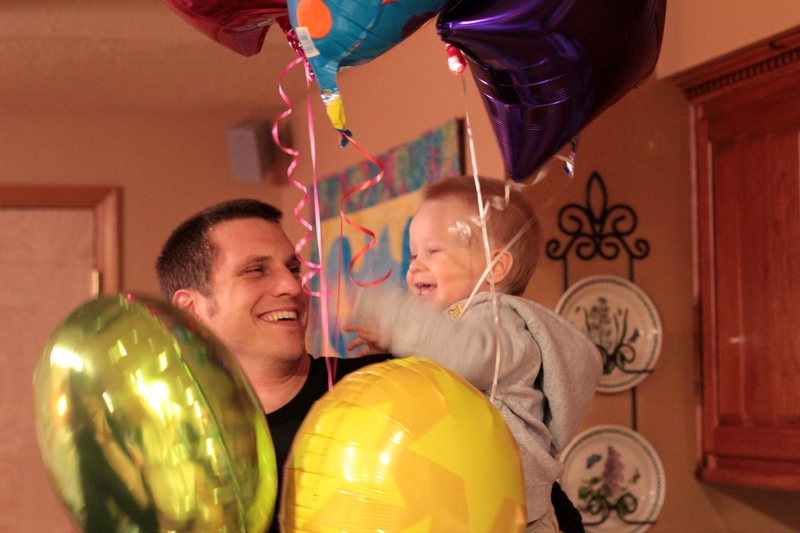 To help Eric ring in the 30s, we had a party last Saturday night, full of good friends and great food. I made some lemon poppy-seed cupcakes with raspberry preserve filling, banana pudding, orange-cream cheese dip, and slushie punch. Along with some chips and salsa–you know, to balance out all the sweet stuff. 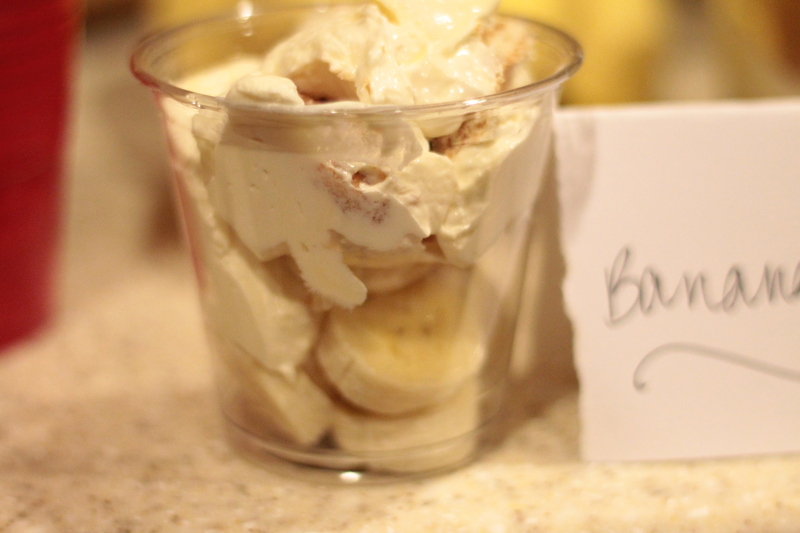 I was first introduced to banana pudding when my sister, who now lives in North Carolina, made some on a visit home. I couldn’t believe what I was missing! And because there are bananas in it, I like to think of it as a healthy dessert. That’s why I end up eating more, haha. Normally our family serves it in a 9 x 13″ pan, but since it was a party, I made it in a trifle bowl, and had two layers instead of one. It looked a little fancier. Some people serve this dessert with a layer of bananas first, before chilling it, but I cut up the bananas when I’m ready to serve the dessert, because I hate them when they get all brown and mushy. But you can do either way, whatever suits your fancy. P.S. If you want to sound official, you have to pronounce this dessert right. Those from the South don’t pronounce pudding like we do in the Northwest. They pronounce it puddin, like Pudd’nhead Wilson. (Mark Twain–sorry, I’m an English teacher. I just had to put that in there.) The g is silent. Line the bottom of a 9×13-inch baking dish with Nila wafers. Using a mixer, mix the milk and pudding for about 2 minutes. Using a handheld mixer, combine the cream cheese and condensed milk together and mix until smooth. Fold the whipped topping into the cream cheese mixture. Add the cream cheese mixture to the pudding mixture and stir until well blended. Pour the mixture over the cookies and cover. Refrigerate at least 3 hours before serving. 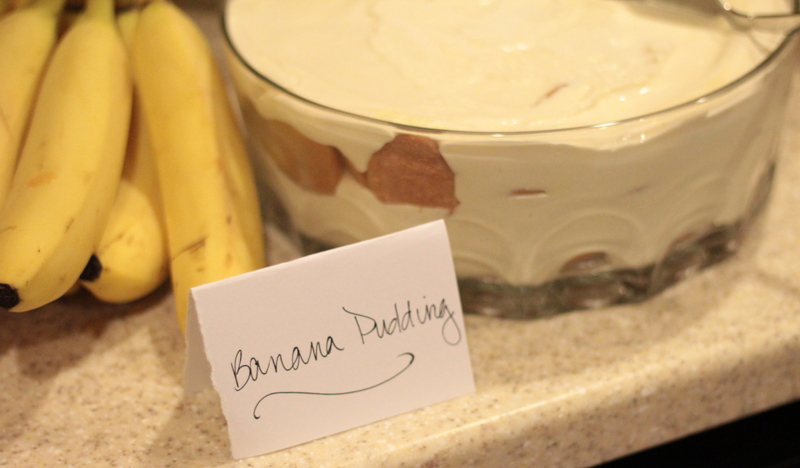 To serve, slice bananas into the bottom of a bowl and scoop out pudding mixture and place on top of bananas. 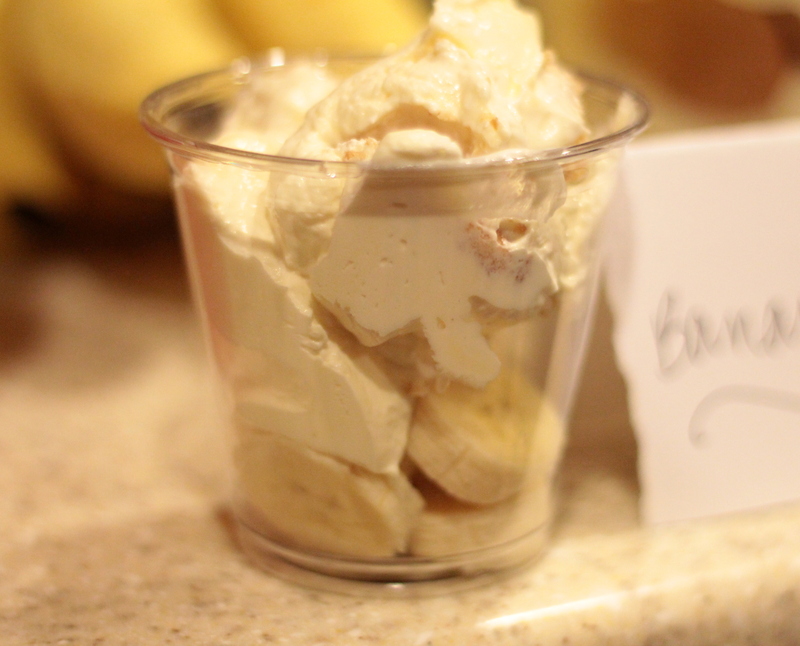 Oh man…I do love some banana pudding. My leftovers don’t really last very long either, but that is because I usually can’t help myself and eat it all! 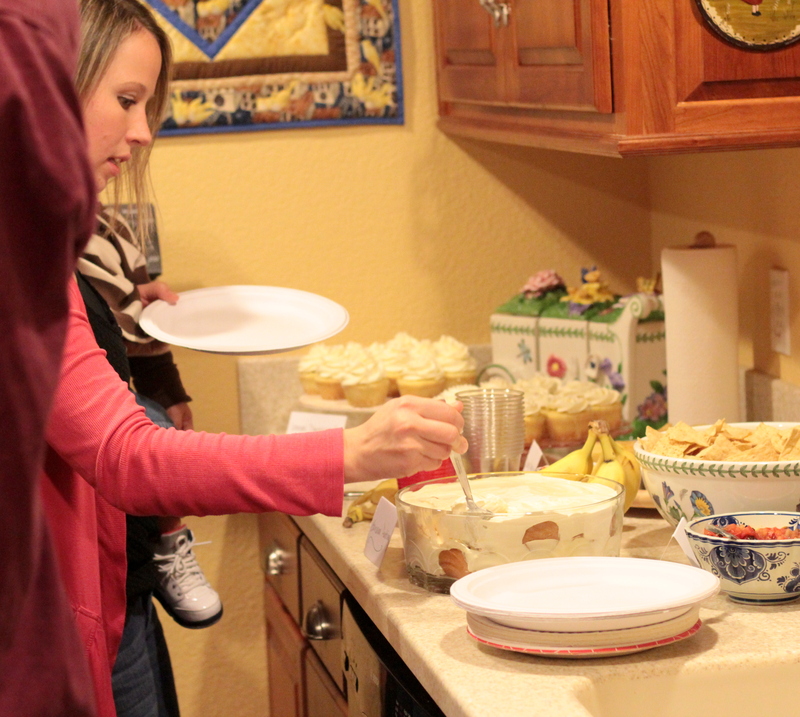 Looks like a fun party with some good desserts!!!!!!!!!! !